Here is the wet bar sink area before any work was performed. Notice the etching. This is the same countertop with StoneGuard® applied. This will be nearly impossible to etch. Here is the dull-looking black marble top before the StoneGuard® application. This is the same countertop as the previous image. The StoneGuard® gives the marble finish such reflection! 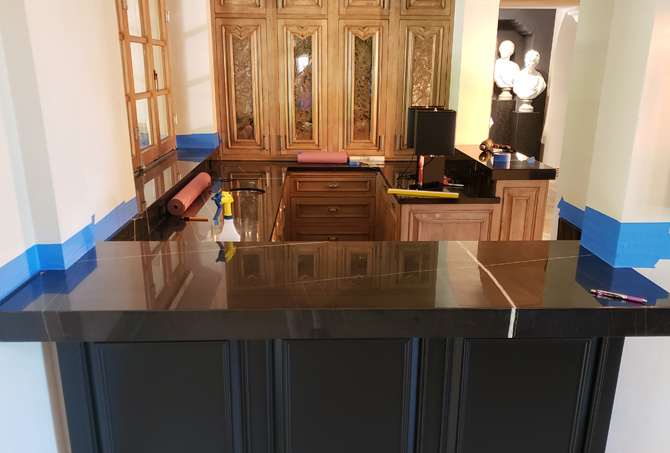 Homeowners in Paradise Valley, Arizona were so pleased with the results of our StoneGuard® application on the red marble island tops in their kitchen that they asked us to take care of their black marble wet bar, as well. A well-used wet bar is constantly exposed to acidic substances commonly found in drinks and sauces. 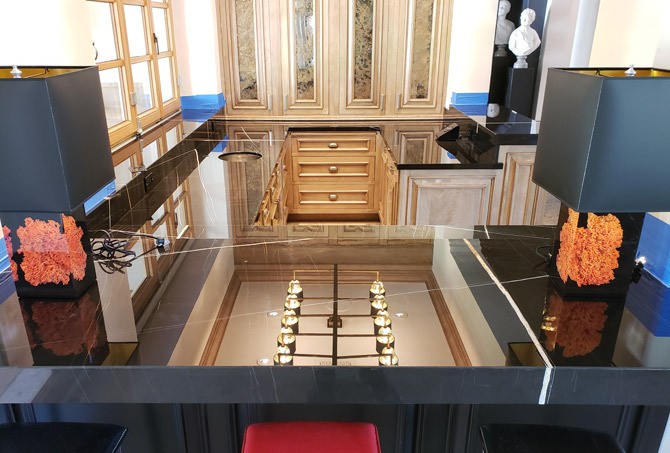 The black marble finish on this wet bar had become etched and dull. Here’s how we applied the StoneGuard®, a protective polyethylene film that adds a new level of protection against etching and other damage. 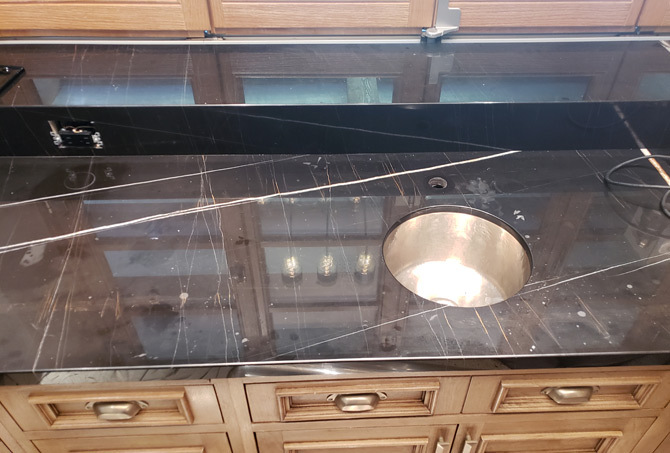 First, we removed the etching on the wet bar tops by honing with a hand tool mounted with diamond infused pads. We carefully cleaned the top, using a microfiber towel, StoneGuard® Surfectant cleaner, and warm water. Once the top was completely dry, we applied a priming agent and performed a bond test. With everything prepped and completely ready, we applied the StoneGuard® using adhesives and special tools. Throughout the application process, we pressed out any water or air pockets trapped between the film and the marble, achieving beautiful, firmly bonded results. Read the StoneGuard® Protected Red Marble Island Tops case study. To learn more, visit our StoneGuard® page. Beyond Stone Solutions is the only authorized natural stone applicator for StoneGuard® in Arizona. 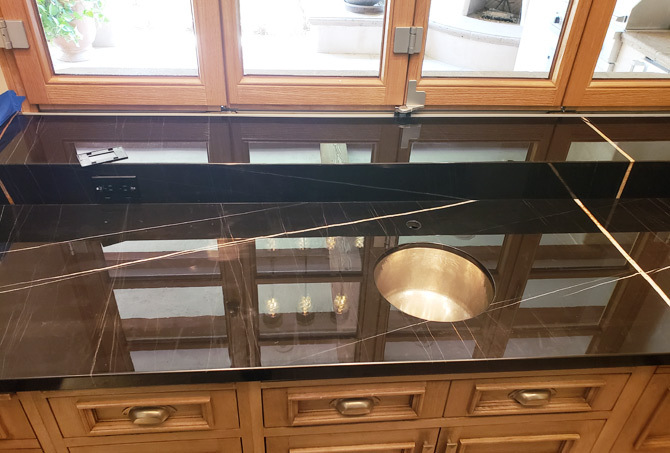 Protect your countertops with StoneGuard® Stone Surface Protection Film today. For a free estimate on StoneGuard® application services throughout the Phoenix, Scottsdale, and Tempe area, use our contact form or call (602) 993-9800.